Appendix F. "Ephelia's Orange Tip"
the first Butterfly Patronym for the Ephelia Poet. (iv) the ostentatious and ginger-haired Mary Villiers evidently favored shades of gold and orange: Lady Mary's gown in Van Dyck's double portrait of her and Anne Gibson displays extravagantly long, voluminous sleeves of an orange-gold; Wilton House copy (see Image 11a). For scientific commentary on the Orange Tip, see (i) John Heppner, "Shall the Duchess of Richmond Have a Butterfly Patronym?" (Antenna [Royal Entomological Society, London; January, 2001, pp. 6-8, with portrait]; rptd from Heppner's full-page note in his Lepidoptera News (Association for Tropical Lepidoptera, June, 2000, p. 17), with large images of the male species, dorsal and ventral sides; (ii) The Aurelian or Natural History of English Insects..., by Moses Harris (1766; rpt., 1986), p. 156, extended description, with several images of both the male and female Orange Tip, p. 34ff; and (iii) The Moths & Butterflies of Great Britain..., eds. A. Maitland Emmet & John Heath (Colchester, Essex: Harley Books, 1989), Plate 5, Image 11. This photograph, from Emmet & Heath, is used with the kind permission of Harley Books. Artist, Richard Lewington. 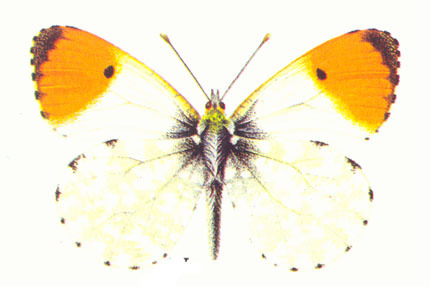 Dr John B. Heppner, who graciously found and named the first butterfly patronym for the Ephelia poet, Ephelia's Orange Tip, imaged at the top of Appendix F, explained in an email note of 5th December 2006: "Delightful serendipity here. Yet keep in mind that these butterflies are sometimes similarly named, all over, and this becomes confusing for non-specialists; but there are in fact significant differences. The Orange Tip species in Sri Lanka is in fact the Tropical Asian Giant Orange Tip, which is about six times larger than the species in Britain, which is now associated with the orange-haired ‘Ephelia’ writer, Mary Villiers, Duchess of Richmond. 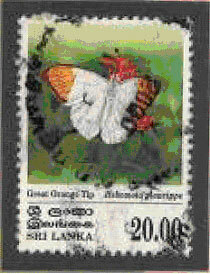 The much larger Sri Lanka Orange Tip is a far different species, with a wholly different generic name, as indicated on the stamp itself (Hebomoia glaucippe). To the untrained eye, the two species look similar, especially when comparably scaled, but the difference in size is amazing. The popular Butterfly House at The American Museum of Natural History, New York City, may have a Great Orange Tip, even on display. If not, flutter up to The Bronx Zoo, and then add any pertinent information to this note. This is all useful context on the Orange Tip butterfly, no matter where it flits." In the spirit of this subject, Pattie Tierney cleverly created a facsimile of the Ephelia's Orange Tip butterfly and attached it as a charm to the bracelet which I purchased from her design company, Autumn, 2006.